This week the network European Investigative Collaborations (EIC) started publishing Court Secrets – a series of articles on the policy and actions by the first prosecutor of the International Criminal Court (ICC). The series is based on over 40,000 leaked documents, financial statements, diplomatic cables and correspondence. It reminded me of my own encounter with Luis Moreno-Ocampo when I interviewed and observed him while he was still ICC chief prosecutor. ‘With irritation prosecutor Luis Moreno-Ocampo responded to the question. It was still in the early stages of the interview, and his reaction came abruptly and unexpectedly. The question hadn’t been outrageous, I thought. It had seemed a normal thing to ask: what personal characteristics do you need to possess to be a good prosecutor? It was autumn 2011. The Argentine lawyer was into his eighth year leading the Office of the Prosecutor (OTP), the organ of the court tasked with investigating international crimes and prosecuting the main perpetrators. Two years before this interview I had seen the prosecutor live for the first time – although from a distance. He was invited as the special guest for the presentation of a documentary about the work of the ICC in general, and more specifically about Moreno-Ocampo’s OTP, during the Movies that Matter Festival, organised by Amnesty International in The Hague. A film crew had been following the prosecutor for three years. The result, ‘The Reckoning: The Battle for the International Criminal Court,’ was shown to the public that evening. The hall of Theater aan het Spui filled up. The guests, half of whom were ICC officials, climbed the stairs to find themselves a seat. After an introduction the lamps dimmed. On the big screen the first images appeared of a documentary about the court and its mediagenic prosecutor. After a full hour the lights flipped on again. A table and two chairs had been placed before the screen for an interview between journalist Linda Polman and the main character of the documentary. The two walked to the stage, where Polman invited Moreno-Ocampo to take a seat. The prosecutor ignored her request. He preferred to stand, made a few steps until he was right in front of the audience, raised his arms and with a big smile encouraged his staff: get up, this movie and screening are in honour of you! Happily surprised, the court officials got up from their seats as they heard Moreno-Ocampo’s encouragements to applaud. Soon the staff were standing, clapping joyfully for themselves, while the rest of the audience moved uncomfortably in their chairs – looking around in amazement as the screening had turned into an ICC celebration, in which they didn’t participate. In this festive ambiance, Moreno-Ocampo seemed even less inclined to take part in an interview with a critical journalist. Again he refused to sit down next to the small table. Like an Argentinian cowboy he put his foot on the seat of the chair reserved for him, focused on the audience and reacted with repulsion to Polman and her questions. He did not even want to talk much about the Darfur case, in which he had won a major victory a few weeks before. On 4 March 2009 the judges had honoured his request for an arrest warrant against the Sudanese president Omar Hassan Ahmad Al-Bashir, charged with crimes against humanity and war crimes committed in Darfur. Moreno-Ocampo had wanted to prosecute the head of state for genocide as well, but the judges ruled he hadn’t provided enough evidence to support charges for this crime of crimes. The prosecutor appealed that decision. A year later, on 12 July 2010, the pre-trial judges would issue an arrest warrant for genocide charges as well. Back in the theatre the prosecutor didn’t feel like responding to journalistic questions such as: would the arrest warrants not trigger revenge by the Sudanese regime against the population in Darfur? Moreno-Ocampo was, in fact, looking for a way to cut short the interview. Again he walked to the public, then stood still and asked one of the filmmakers to take his place on the stage. The painful session came to an end. Later in the foyer a concerned organiser of the Amnesty film festival came up to journalist Polman asking: ‘What went wrong?’ It was anyone’s guess. One ICC official briefly approached Polman and suggested the prosecutor did not like being grilled by female journalists. Further down in the foyer the ICC staff were having a great time amongst themselves. Polman and her problematic interview had ceased to exist. Several African governments complain that the ICC has been targeting Africans. But national authorities are by no means powerless when it comes to the court. Here are fifteen – successful – strategies that governments and allies have been using to keep the ICC off their backs. 1. The obvious and by far the best option: Don’t commit genocide, crimes against humanity or war crimes (as the ICC is tasked only to go after perpetrators of these international crimes). 2. States: don’t join the ICC, so the court doesn’t automatically have jurisdiction, which reduces the risk of investigations on your national territory. This strategy is applied by many nations such as the United States, China, Russia, India, Syria, Sri Lanka and Myanmar. 3. If countries have joined, they can also leave. Member states are allowed to withdraw. Burundi, which is feeling the heat as the ICC opened a preliminary examination into atrocity crimes in April 2016, decided half a year later, in October, to pull out. This was clearly out of self-interest. By doing so the government tries to prevent the ICC from starting a full-blown investigation which could lead to charging individuals. The ICC has to decide before the withdrawal is active, in October 2017, to open a full investigation in Burundi. 4. Make sure you are a member of, or have good friends on the United Nations Security Council. The UNSC has the power to refer situations in countries that are not ICC-members to the court in The Hague, as it did with Sudan in 2005 and Libya in 2011. The Syrian regime for instance benefited from its good relations with Russia. In 2014 Moscow (and Beijing) blocked a UNSC referral (the other 13 were in favour). 5. On this note, the three permanent members of the UNSC, who never joined the ICC, are in a comfortable position. Clearly the United States, Russia and China won’t refer their own conflict situations and human rights violations for investigation to the ICC. Although that position might not always save them. The ICC’s Office of the Prosecution (OTP) is examining international crimes in member state Afghanistan. If it decides to do full investigations, the prosecution probably will look at accusations of atrocities by American armed forces and CIA officials in Afghanistan, and in secret CIA detention centres in Poland, Lithuania and Romania which are related to this situation. 6. Bilateral immunity agreements with countries promising to never handover a national to the ICC. This strategy was applied by the United States. ‘The bilateral agreements sought by Washington would require states to send an American national requested by the ICC back to the U.S. instead of surrendering him/her to the ICC,’ Human Rights Watch wrote in 2003. By 2006 more than 100 countries (including Afghanistan) had signed such an agreement, said the Coalition for the International Criminal Court. 7. The United States also adopted the American Service-Members’ Protection Act, in 2002. Better known under its nickname: The Hague Invasion Act. The law ‘authorizes the use of military force to liberate any American or citizen of a U.S.-allied country being held by the court,’ Human Rights Watch wrote. 8. This tactic seems counter-intuitive but has proven effective: self-referrals. It sounds tricky for a government to invite the ICC to come and investigate atrocities committed on its territory, especially when authorities are possibly involved. But history has proven that in case of these self-referrals, the ICC has a tendency to go after adversaries of these governments. In Uganda, the Democratic Republic of Congo and Central African Republic, for instance, rebel leaders, militia and political opponents are prosecuted by the ICC, while members of the government and security forces remain as yet untouched. 9. If they cannot avoid being charged, high profile leaders are better off cooperating with the ICC’s summons to appear and thus prevent an arrest warrant. That’s what happened in the Kenyan cases. Because the Kenyan ICC suspects Uhuru Kenyatta and William Ruto cooperated, they were not detained in The Hague and could rally against the court and campaign freely. This won them the 2013 elections from which they emerged as president and vice-president. 11. Obstruction of the transfer of evidence to the ICC, even though the prosecutor has permission to do investigations on a nation’s territory. The OTP insisted Kenya had to handover specific information so the prosecution might beef up its evidence against president Kenyatta after key witnesses had proved to be unreliable. The Kenyan authorities refused to give most of these materials, such as telephone data. 12. Witness interference. It happens in many cases before the ICC, but it was fatal for the trial against Kenyan deputy president William Ruto and journalist Joshua Sang. The presiding judge concluded: ‘The proceedings are declared a mistrial due to a troubling incidence of witness interference and intolerable political meddling that was reasonably likely to intimidate witnesses.’ His co-judge stressed Ruto and Sang weren’t involved in pressuring witnesses, but did profit from it.So far the Kenyan government hasn’t transferred any 0f the three Kenyans, charged by the ICC with threatening and bribing witnesses, to The Hague. 14. Being wanted by the ICC doesn’t mean that a powerful suspect’s freedom is over. Again, good relations are vital. Sudan’s president Omar Al Bashir, charged with genocide, crimes against humanity and war crimes in Darfur, travels all the time. Even to ICC member states such as South Africa who refuse to arrest him. Being a president Al Bashir is a successful fugitive. 15. File an admissibility challenge arguing that the ICC doesn’t have the mandate to do this case because national authorities are already working on investigations and prosecutions. Kenya tried this road, but failed. But it missed a chance there. Basically the Kenyan state wanted to make use of the principle of complementarity. The ICC is a court of last resort. It only comes into action when states are unwilling or unable to act. This means that governments have the power to take their own responsibility to investigate and prosecute perpetrators themselves, so that the ICC doesn’t even have to intervene. In times of conflict and large scale violence, many people put their hope on the International Criminal Court. They call on the ICC to act, to go after the perpetrators and stop the suffering. They want justice to be done. Despite the calls for action, the reality is that the ICC doesn’t have (automatic) jurisdiction in Myanmar, because the country never became a member of the court. That’s how the rules are. This means that the ICC doesn’t have the power to initiate by itself investigations into the violence in Rakhine state. The only way that the court could become active in non-member states such as Myanmar, is when the United Nations Security Council agrees to refer the situation in Rakhine state to the ICC. In the past this happened with Sudan/Darfur (in 2005) and Libya (in 2011). But with China being a permanent member of the council, this is extremely unlikely in the case of Myanmar. The big neighbour will say: no. China has huge geopolitical and economic interests. Instead of seeking a confrontation with the Myanmar authorities – by giving the ICC’s investigators the green light to go after the individuals organising the violence – China will prefer to work on good relations with its southern neighbour. Russia won’t be keen to refer the situation either, as it has been supplying weapons to the Myanmar military. The ICC has the task to investigate international crimes (genocide, crimes against humanity and war crimes) and to charge the individuals most responsible for these atrocities. The court has no mandate in Myanmar, but if it had, it would be doubtful whether Aung San Suu Kyi would be the main target of ICC investigations. She fails terribly in her duty as the country’s leader by keeping silent and not protecting her people, but she is confronted with huge political constraints and has no say over the security apparatus. In Rakhine state a military operation is taking place, which is organised, planned and ordered by the army. If one day a criminal court or tribunal would get the go ahead to investigate the violence in Rakhine state – indeed Bangladesh is calling for this – the chain of command will probably lead from soldiers on the ground, directly involved in the violence, to the generals, who are calling the shots. against the device. Arriving at the last door, she takes out her hand-phone and calls for a final okay. She then pushes the heavy door that gives access to the protected wing, enters the corridor and walks to the room of Gilbert Bitti, an amiable Frenchman who works as senior legal advisor for the judges of the pre-trial division, that handles cases in the entire phase before the trial. In his appearance – spectacles with a light metal rim – he resembles a professor who’s passionate about his subject. When he is present during hearings in the courtroom, he is recognizable because of his full beard. But now, after some drastic razor blade action, suddenly his shaven jaws are visible. delegation at the United Nations. government was led by the socialist prime minister Lionel Jospin. The Democrat Bill Clinton was president of the United States of America. The basics were in place. The United Nations had – after a vacuum of forty years since the war tribunals of Nuremberg and Tokyo – established two new ad hoc tribunals to punish suspects of international crimes committed during the wars in Yugoslavia and the genocide in Rwanda. ‘The moment I return to the Democratic Republic of Congo I run the risk of persecution. I will disappear without a trace or be arrested,’ former Congolese militia leader Mathieu Ngudjolo Chui said at the end of a long day, Thursday 16 April, at the district court in Amsterdam, The Netherlands. ‘I urgently request you to grant me protection,’ he said, pleading for asylum which again had been denied by the Dutch government. Despite his uncertain situation Ngudjolo, carrying a small silver cross in the lapel buttonhole of his jacket, seemed mentally strong, while holding a small dictionary, Dutch-French, in his hands. On 27 February 2015 the appeals chamber of the International Criminal Court (ICC), based in The Hague, confirmed his acquittal. The judges’ ruling put a final end to his trial which started in 2009 and saw him charged with crimes against humanity and war crimes for the brutal attack on 24 February 2003 on the village of Bogoro, in the eastern district of Ituri in the DRC. Two hundred villagers were slaughtered that day and Ngudjolo had been held responsible for leading a group of militia involved in the attrocities. The judges ruled however that the evidence against Ngudjolo was lacking. While two of the five appeals judges were in favour of a new trial against the Congolese militia leader, the majority ruled he should be acquitted. This, however, did not make him a free man. Immediately after the decision, still in the ICC building and without his lawyers being informed, Ngudjolo was taken by Dutch police to the main national airport Schiphol and put on a plane to the DRC. During these crucial moments his Dutch lawyer Flip Schüller managed to apply for the asylum request, which led to the upholding of his deportation. While already on the runway the plane returned to the airport building where Ngudjolo was detained. After an initial successful appeal by counsel Schüller against his custody, that decision was overruled by the Council of State. Since then Ngudjolo has been in detention at the airport. During the hearing at the Amsterdam district court it became clear the ICC has changed its views on Ngudjolo’s risks if returned to the DRC. Last year the court’s Victims and Witnesses Unit (VWU) was still convinced Ngudjolo would not be safe in his home country. The unit has left that position. While referring to a confidential VWU-report the Dutch state advocate Elisabeth Pietermaat said that ‘if Ngudjolo would fear revenge in Ituri, he better settles in Kinshasa.’ Schüller however said he had received letters, including from Amnesty International, warning his client would face serious security risks in the DRC. The events seem like a repetition of Ngudjolo’s earlier experiences. When he was acquitted in first instance by the ICC on 18 December 2012 (though the judges stressed that deciding ‘an accused is not guilty does not necessarily mean that the chamber finds him innocent’) the Dutch authorities also tried to expel the Congolese ex-warlord. When he was forced to board a plane to the DRC, Ngudjolo requested for asylum in The Netherlands. He was detained at the airport for several months, when in May 2013 the Dutch court ruled he should be released and compensated with 2400 euro by The Netherlands for unlawful detention. Ngudjolo was back in the care of the ICC, which arranged a hotel for him where he could stay. In 2014 the Council of State, the highest court for administrative matters, decided that the Dutch government were right in denying Ngudjolo asylum referring to the 1F clause in the international refugee convention, which says that protection can be denied if there are serious indications an asylum seeker has been committing human rights violations. The Congolese warlord was however allowed to stay in The Netherlands to await the outcome of the IC’s appeals chamber in the Bogoro-case. Ngudjolo is not the only Congolese related to this ICC-case who applied for asylum. Three witnesses, who testified in favour of him before the court, requested for protection in The Netherlands after they delivered their sworn statements. The three men were special witnesses. As former comrade fighters of Ngudjolo they had been in prison without trial for several years in the DRC when they were transferred to The Hague to give testimony in March 2011. The Congolese government, The Netherlands and ICC had agreed they would return immediately after. But their asylum application blocked their return. After years of judicial procedures the State Council ruled however the three witnesses weren’t at risk in the DRC and that The Netherlands could trust the guarantees by the Congolese government that they would be treated well and that a court case would be speeded up. Eventually the three were deported in July 2014. However so far there are no signs of a trial against the three, their Congolese lawyer in the DRC is being threatened and two of them are not getting the necessary medication. ‘They will die,’ a source close to the defence said. On Thursday 23 April the judge of the Amsterdam district court ruled in Ngudjolo’s case deciding the Dutch authorities made no mistake in their handling of the rejected February asylum claim. His lawyer Schüller will appeal. Ngudjolo’s fate is now in the hands of the Council of State, which will decide on his detention, his release or possible deportation to the DRC. For the time being Ngudjolo remains detained at Schiphol airport. A modest ceremony was held at the International Criminal Court (ICC) in The Hague on the 1st of April to welcome its new and 123rd member: Palestine. The vice-president of the court, judge Kuniko Ozaki, said Palestine acquires ‘all the rights as well as responsibilities that come with being a State Party.’ She added: ‘These are substantive commitments, which cannot be taken lightly.’ From now not only Israelis, but Palestinians as well can be prosecuted by the ICC for international crimes – genocide, crimes against humanity and war crimes. This historic step has led to angry reactions from Israel and the USA, both countries are no party to the ICC. Since the start of 2015 Israel stopped transferring tax revenues to the Palestinians, which amount to some 400 million dollar (last week it was announced the money tap would be reopened). Such reactions are especially painful since the preamble of the Rome Statute, the legal document containing the main rules of the court, refers to the horrors of the twentieth century during which ‘millions of children, women and men have been victims of unimaginable atrocities that deeply shock the conscience of humanity.’ A phrase that also refers to the Holocaust. Human Rights Watch explains in a press release that US President Barack Obama signed into law an act that would cut off aid if the Palestine government would support the ICC in investigating Israeli nationals for crimes against Palestinians. Human rights organisations point out – rightly so – that Palestine has the same right to join the ICC as the other 122 countries who have done so far – including my own, The Netherlands. Since the ICC will only have jurisdiction over international crimes as of 1 April, the explosion of violence of last summer would formally not be included. In a special declaration the Palestinian Autority has therefore mandated the court to investigate crimes committed ‘in the occupied Palestinian territory, including East Jerusalem, since June 13, 2014’ when Gaza was bombed by the Israeli army, while Palestinian militants fired rockets on to Israel. In a few weeks’ time 2100 Palestine (mainly civilians) and over seventy Israeli’s (mainly military) were killed. Television camera’s recorded the massive destruction in Gaza.The rules prescribe that after such a declaration the Office of the Prosecution (OTP) has to conduct a preliminary examination to see whether or not the situation meets the criteria to start a full criminal investigation. In the meantime the Palestinian government has announced that the settlements could be a case as well. Under the ICC rules it is a war crime when an occupying force like Israel is transferring parts of its own population to occupied territory. The Palestinian accession to the ICC is a big test for all parties involved. The court only comes into action when states are not able or willing to investigate cases themselves. Israel and Palestine can still take their own responsibility. The chances are small this would result in effective prosecutions, but if this happens many at the court will sigh with relief. Not only because the ICC is in favour of national proceedings, but also because of the sensitivity of this file, which could further harm the court. If the ICC would decide to open a Palestine case and out of protest countries would refuse to cooperate with the court, this would badly hamper the functioning of the institution. On the other hand such a case could result into credit for the ICC as well. So far the court is investigating in eight African countries. The 36 suspects are all Africans – militia leaders, government leaders, officials, two lawyers and journalists charged with international crimes and offenses against the administration of justice. A Palestine case would divert the criticism in official African circles that the ‘neo-colonial’ court is targeting Africans. The matter can also become a test for the UN Security Council. There are signs that the USA is ready to invoke article 16 of the Rome Statute: deferral of investigation or prosecution in situations of peace or security. This article says that ‘no investigation or prosecution’ may be started in such a specific case for a period of 12 months after the Security Council has requested the Court to that effect. In exchange for a deferral political concessions like a two-state solution could be proposed. But would countries like France and the UK – both member of the ICC and UN Security Council – be okay with exchanging justice for an uncertain peace and vote for postponing a Palestine case? As such it is remarkable that Israel seems to fear the court, which hasn’t achieved much result. The ICC, that started operating in 2002, has convicted two Congolese militia leaders. The cases against seven suspects have collapsed. The most dramatic decision fell on 5th December 2014 when prosecutor Fatou Bensouda was forced to withdraw charges against the Kenyan president Uhuru Kenyatta due to lack of evidence. She lost the case because her office had trusted witnesses who lied, while other witnesses withdrew after having been intimidated and threatened and the Kenyan state obstructed investigations. Even if the ICC would open a Palestine investigation, it is not certain whether suspects would ever be sitting in the dock. There are internal obstacles – the OTP has been marred with problems – and external obstacles – without state cooperation the ICC can’t function. How much access would ICC investigators be granted by national authorities to gather evidence against potential Israeli (and Palestinian) suspects? How likely is it that defendants will be handed over to the court. Similar problems have previously blocked and even ruined cases. The future will tell for which party – the states involved, the international community and the ICC – the Palestine Test will be the heaviest. The small white sign near the public entrance of the International Criminal Court (ICC) carries three vital words: ‘Pas Op! Schrikdraad.’ The vast majority of the court’s visitors however won’t notice this crucial warning. Not only because of its inconspicuous size, design and spot on the fence, but also because most visitors are from abroad and don’t understand the Dutch text that warns for an electric shock if one touches the trellis work. The long fence that surrounds the court buildings carries a few more signs. But since a version in English or French – the working languages of the court – seems to be absent, I started to wonder whether I actually had to take that whole warning seriously. Welcome to the ICC, that forgot to inform its visitors about the dangers of its trellis work. 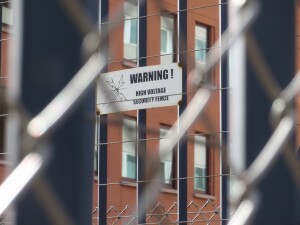 Only when I started searching I saw a glimpse of an English sign: ‘Warning High Voltage Security Fence,’ written on tiny notices, few in number, practically invisible attached to the inside of the fence. Visitors enter the building by taking the revolving door that leads to a large hall, where uniformed guards with stern faces check the arrivals. Obediently guests and court officials put their coats, bags and other belongings on the X-ray belt. They then step into the walk-through gate detector. As if they check-in for a flight. These are appropriate security measures for an organisation that is prosecuting war lords, militia leaders, military, presidents, politicians, officials and other powerful persons suspected of massive atrocities that deeply shocked humanity’s conscience. It was late afternoon, 5 June 2014, when the hearing of the Dutch Council of State came to an end. This was the last public court session to be attended here in The Netherlands by the three Congolese witnesses, who had testified at the International Criminal Court in 2011 and then asked for asylum. Floribert Ndjabu Ngabu, who recently had been on hunger strike, looked remarkably fit. His face was slim. But physically he made a strong and vital impression. Pierre Celestin Mbodina Iribi followed the session with great alertness. It was Charif Manda Ndadza Dz’Na who seemed sick and utterly depressed. During most of the court hearing, Dz’Na sat leaning over with his head on his arms touching the table in front of him. For three hours the opposing parties – the Dutch lawyers of the Congolese men versus the State Advocate representing the Dutch government – had pleaded their cause and answered the questions of the three judges of the Council of State. Now it was over. From their chairs the judges oversaw how the legal representatives of the authorities packed their documents leaving the court room and how the lawyers shook the hands with their three clients and the interpreter and left the place with rolling suitcases. A Dutch policeman walked to one of the Congolese men who was holding a pen. ‘This is not allowed,’ he said and confiscated the pen, which apparantly was seen as a potential weapon. ‘Are they already on their way?’ the policeman then asked in his walky-talky. He was waiting for colleagues to take the Congolese out of the court room and transport them back to the detention facility near airport Schiphol. The interpreter, who had been translating the Dutch proceedings into French, was still waiting with the Congolese men. Spread over the court room several guards were on duty. Until it was time to go. The first to be led away was Dz’Na. When it was Ndjabu’s turn, he made a solemn bow to the judges. His example to be followed by Iribi. These were like scenes from a theatre play with the judges acting like the polite hosts, seeing off their guests. ‘A good evening,’ the policeman, who has been coordinating the departure of the Congolese, said to the judges, still seated overlooking what became an empty court room. It would take the three judges about three weeks to come with a final decision in this long legal battle which led the Congolese witnesses before a series of Dutch courts. This journey started when Ndjabu, Iribi and Manda, who had been imprisoned without trial for many years in DRC, were flown as detainees to The Netherlands in 2011 to testify in defense for two suspects at trial at the ICC: Germain Katanga (found guilty this year) and Mathieu Ngudjolo Chui (acquitted in 2012). During their testimonies the witnesses accused the Congolese president Kabila himself of war crimes. They then feared reprisals and applied from their ICC-cells for asylum. The Dutch government turned them down because they – as militia leaders themselves – might have committed crimes as well. The Amsterdam district court confirmed the Dutch position to deny them protection, but warned that the three could not be returned because they would risk an unfair trial and even the death penalty. On 27 June the Council of State came however to a very different conclusion. They decided there was actually no problem in returning the three Congolese men to the DRC. Because the ICC and the government of the DRC had agreed to a list of ‘protective measures.’ In fact the ICC-judges had already decided long ago these were sufficient guarantees. In their ruling of 24 August 2011 the ICC judges listed a whole list of safeguards: upon arrival in the DRC the three Congolese witnesses would be detained in a secure prison facility guarded by specially trained guards selected in consultation with the ICC, they would be regularly visited in prison by officials of the ICC’s Victims and Witnesses Unit (VWU) and judicial procedures against them would be monitored by the ICC. The DRC had given assurances the death penalty would not be executed. The Council of State attached ‘great value’ to the protective measures and concluded it is ‘unlikely’ the Congolese men will be subjected to ‘abusive treatment, an unfair trial or the death penalty.’ The Dutch judges refered to the Rome Statute which says that cooperation between the ICC and DRC is based on ‘mutual trust.’ There are no ‘concrete signals’ that the DRC would not live up to its promises, the Council of State said. Schüller and his legal team are equally disappointed by the European Court for Human Rights. Two hours after the decision by the Dutch Council of State, the court in Strasbourg rejected their application to halt a possible deportation.